Picutre it. Hot Florida weather and the humidity making it feel like 110 in the shade. You, however, look flawless and just touch-up the powder on your face like the Southern Belle you are or aspire to be. Sound too good to be true? Well, it’s true! 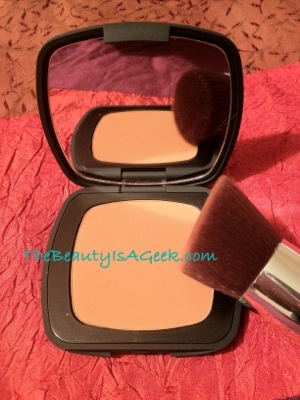 Presenting bareMinerals READY SPF 20 Foundation! 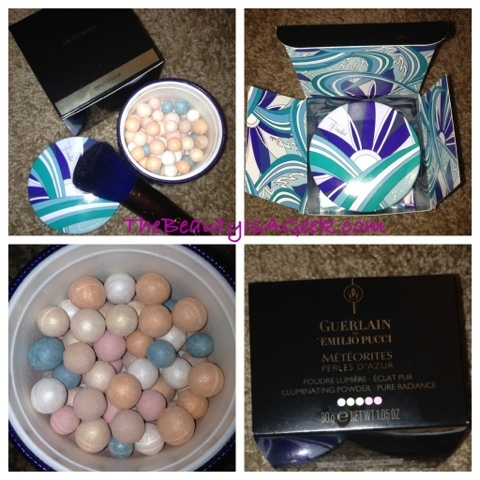 powder before applying it to the face. 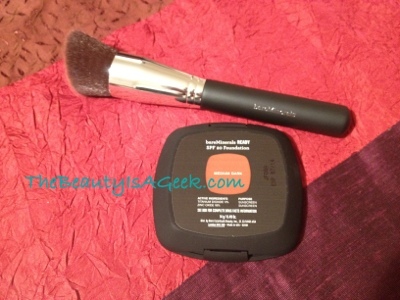 As I am MAC NW 43 (NARS New Guinea and Make Up For Ever #75) I chose foundation shade in Medium Dark. Medium Deep would be my summer/Florida shade. 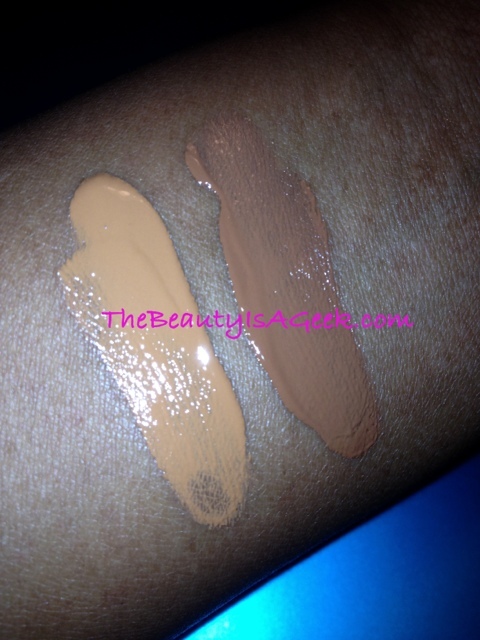 Both shades I have used previously in the loose Matte foundation. Ready foundation builds very quickly and even for oily faces like me it provides a fresh, matte look that didn’t make my face look like a ‘ghost’. 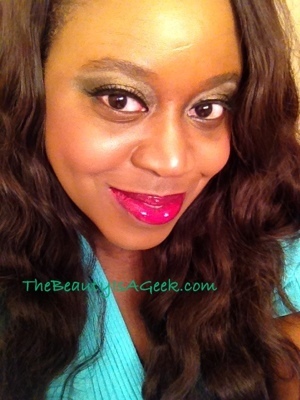 The finely-milled powder blended in with my skintone, giving me a flawless look. I prefer to use this over the NARS Tinted Moisturizer (normal to dry skin) or Smashbox’s Camera Ready BB cream in Dark (for oily skin), but even alone it’s fabulous. I will warn that if you have strong red undertones as I do, pick a share designated for ‘Neutral’ undertones (Medium Dark, Medium Deep, etc) so you look natural and not like an extra from The Walking Dead. 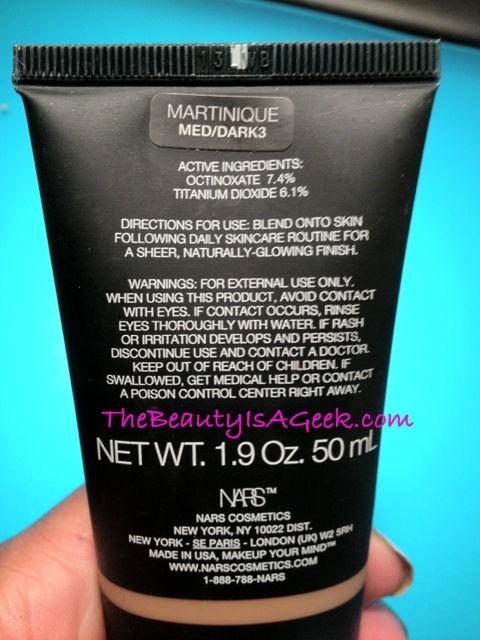 If you have oily skin you *will* need to reapply this within a few hours. 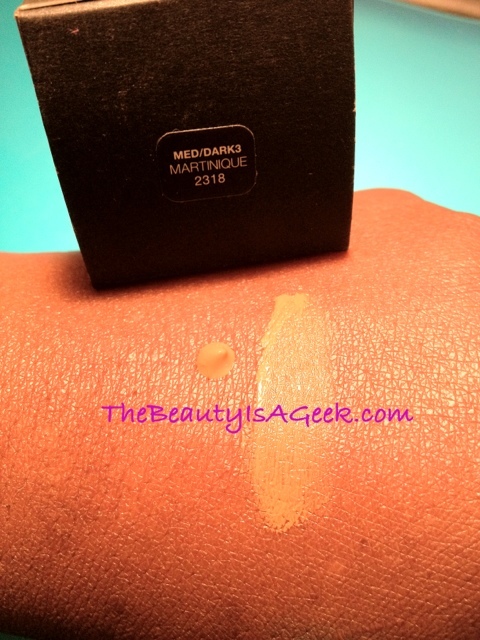 It isn’t a big deal and you will not need much to restore the oily spots back to matte flawlessness. Just make sure to blot the oil off *first* with blotting paper or a tissue then reapply powder. 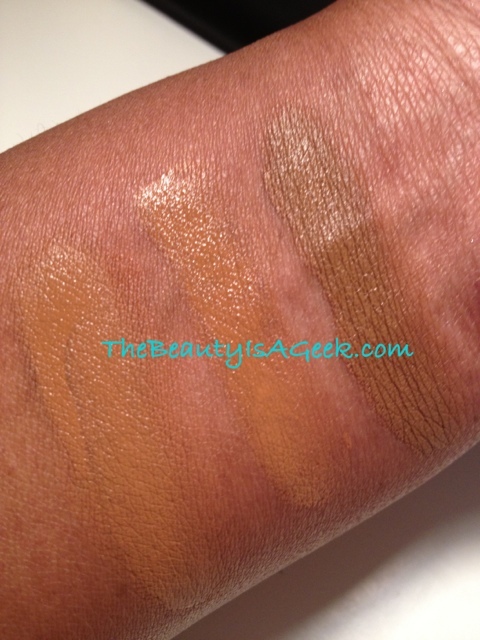 Bare Escentuals READY foundation in Medium Dark over NARS Tinted Moisturizer in Martinique. Chanel glossimer in Jalousie on lips. 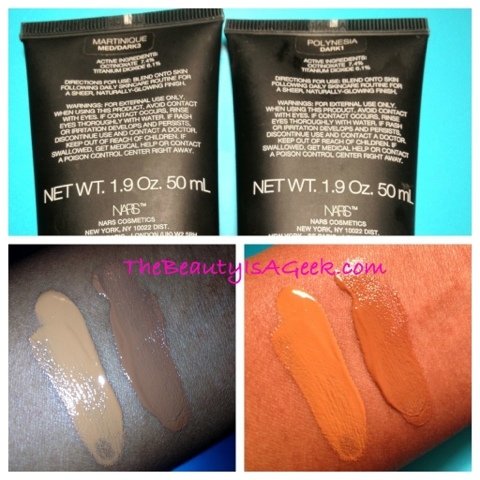 Ready foundation wears extremely comfortable and I felt no tightness nor itching after application and during wear. The SPF20 sunscreen is a physical sunblock consisting of Zinc Oxide and Titanium Dioxide. There are are plenty of great skin-loving ingredients in this foundation, my favorite being jojoba esters as joboba provides moisture without irritating my sensitive skin and there are such skin comforting ingredients as meadowfoam seed oil. I prefer this to MAC’s Studio Fix (which breaks me out) and Make Up For Ever’s Duo Matte powder (no SPF in it), both of which I have used in the past. 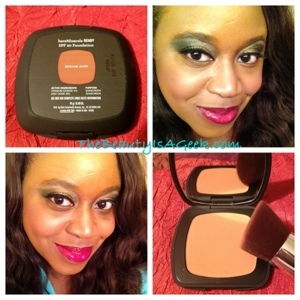 Ready pressed powder foundation from Bare Escentuals costs $29 USD and is available at such retailers as Ulta.com, Sephora.com and Nordstrom. Inactive Ingredients: Boron Nitride, Octyldodecyl Stearoyl Stearate, Caprylic/Capric Triglyceride, Glycerin, Magnesium Silicate, Silica, Nylon-12, Humic Acids, Rosa Canina Fruit Oil, Jojoba Esters, Corallina Officinalis Extract, Lecithin, Betaine, Algae Extract, Mica, Bismuth Oxychloride, Iron Oxides. At times like this, it pays to be a Sephora Beauty Insider. Why? Because I got first crack at ordering pieces from this collection I’ve been waiting for w/ baited breath. 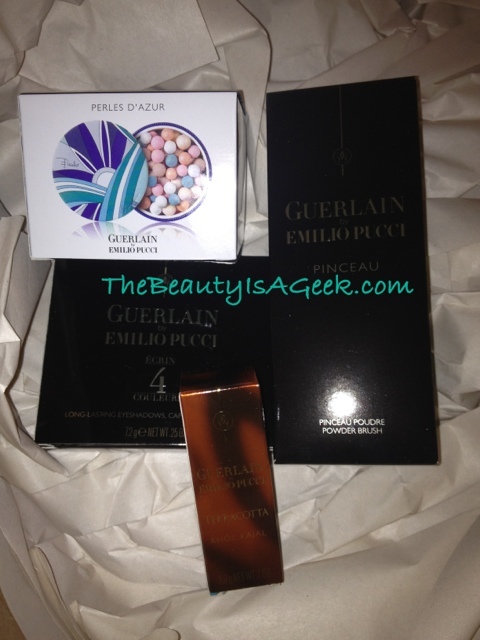 Finally in my possession--the Guerlain by Emilio Pucci collection for Summer 2012. The collection is only available for purchase now by Sephora Beauty Insiders but should be available for sale to the general public in time for it’s publicized May release date. 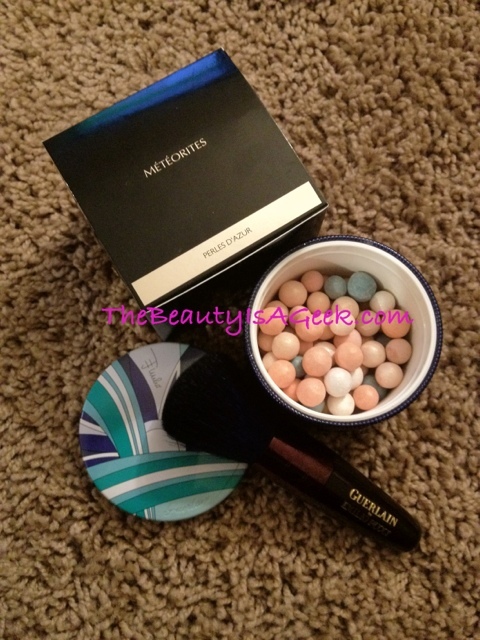 My advice is to keep stalking Sephora, Nordtrom and Neiman Marcus websites for the launch. Considering how fast the Cruel Gardenia highlighter went, the limited edition meteorites from this collection should go just as quickly if not faster due to the Pucci name. Individual product reviews to come in the next few weeks or so but in the meantime check out the picspam and comments! These smell absolutely divine! Even if you bought them to scent your lingerie drawer they'd be worth it. Pucci print all over in my favorite colors. 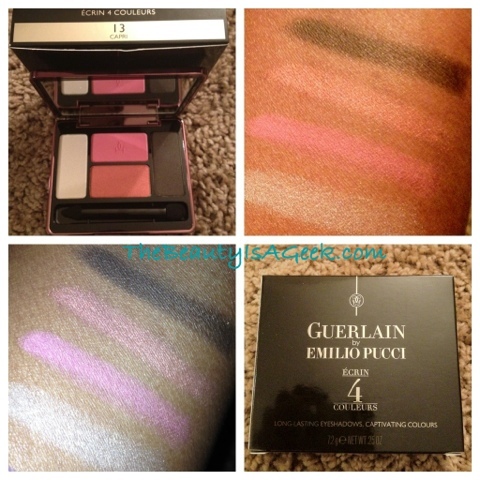 The eye shadow palette in warm colors are perfect for women of color. The cult classic returns in a striking indigo color. 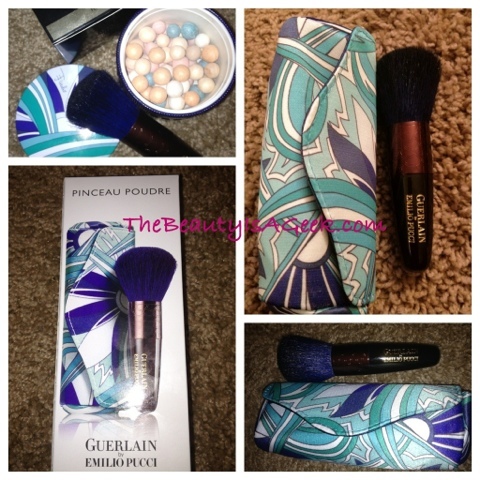 The Emilio Pucci brush. You cannot call yourself a Pucci fan and not get this. 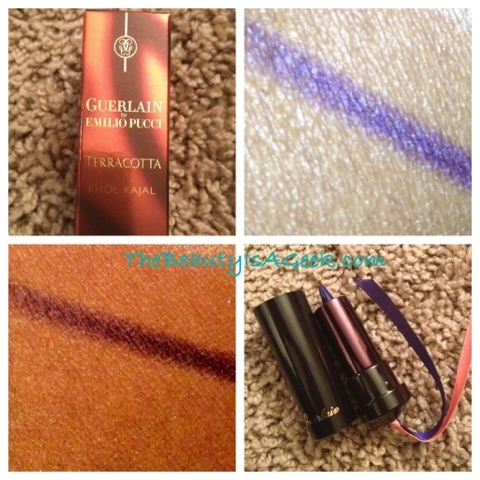 I am so in love with this product I went back for the lighter (and better match to my Winter/Spring skin) shade in Martinique! 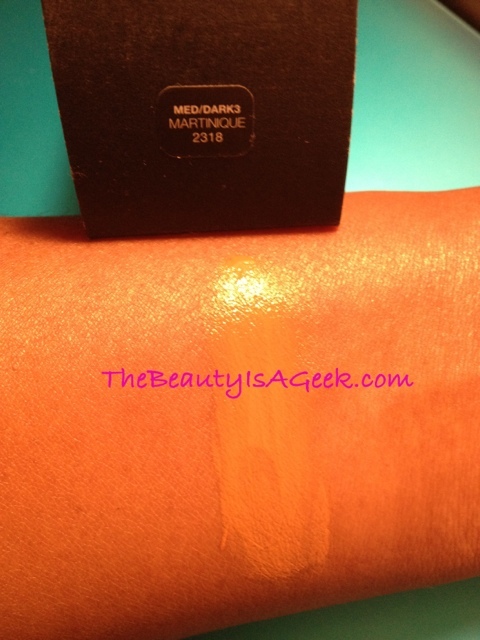 Martinique (which is an island in the Caribbean and yes I was geeky enough to look it up) is described by NARS as a medium-dark with red undertones. 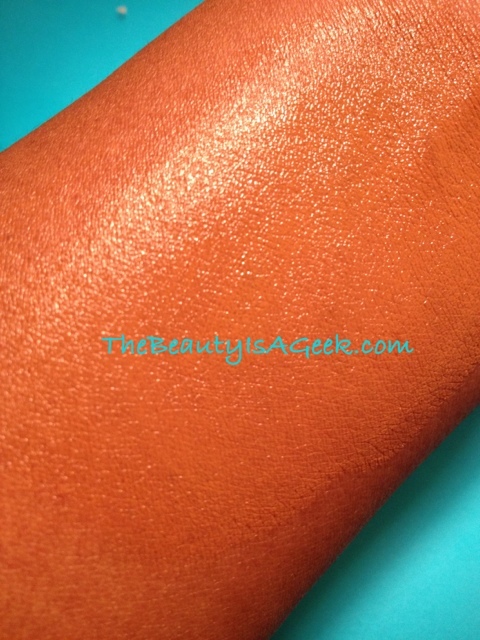 If you wear NARS Sheer Matte/Glow in Cadiz or New Guinea, or NW40 – NW45 in MAC foundations or Make Up For Ever Velvet Mat+ in 70 – 75, this shade is a good color match. 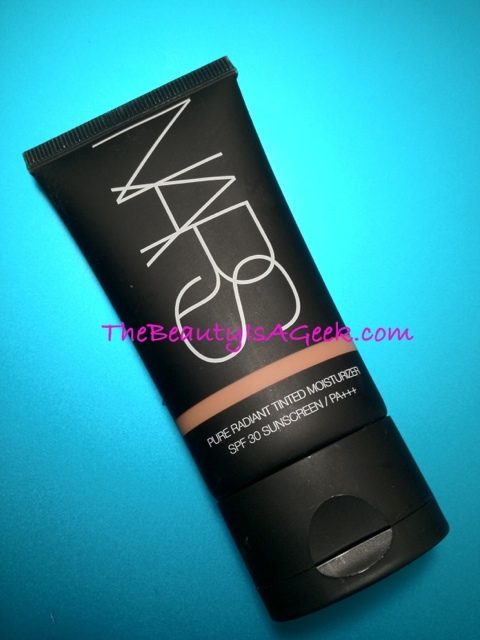 If you’ve read through my review of NARS Tinted Moisturizer in the Polynesia shade, you know how impressed I am with this product. While I loved Polynesia, it really is too dark for my Winter skin (though it did give me a gorgeous summer bronzed look!). After a trip to my local Sephora where they’d just gotten these in stock, one of the sales associates picked out Martinique for me straight away. 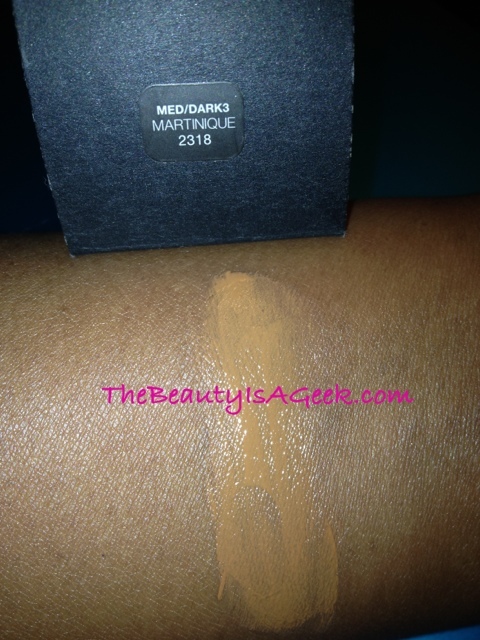 I took a sample home and was so impressed how well this shade matched my skin that I bought the full size. For reference, Seychelles was too yellow in tone though the shade did match and Malaga was also very yellow and obviously too light for me. Cuba was also too light. Also while these colors were too light, the yellow tones were more apparent and the color didn’t look ‘ashy’ on me–just an undertone mismatch. 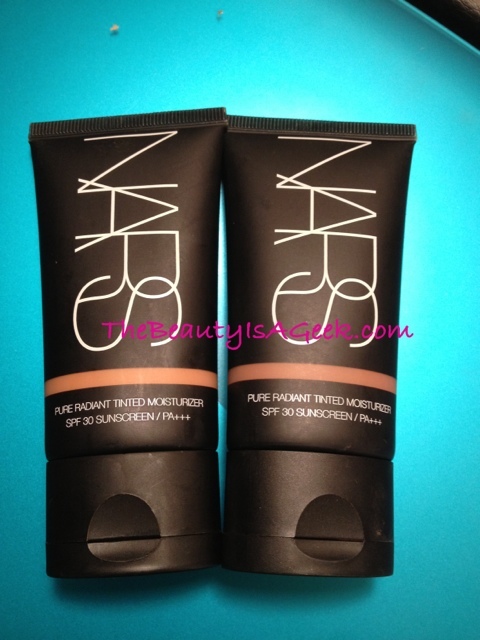 So let’s get to some picspam of NARS Pure Radiant Tinted Moisturizer in Martinique! By now you’re probably wondering how Martinique compares to Polynesia and of course, I’ve got you covered there. Polynesia is more of a dark chocolate as compared to the milk chocolate color of Martinique. The picspam speaks for itself. I mixed Martinique with Polynesia and got the PERFECT shade! I’ve had Polynesia for about a month and Martinique for about two weeks and my impression of this product has only gotten better. I’ve noticed (and other people have too) how my skin is improving with the consistent use of this product. A few acne scars that I had been covering up with concealer have begun to fade noticeably and I’ve got this nice glow going on! Another added benefit is this product has no artificial fragrance and neither is the natural fragrance overpowering. 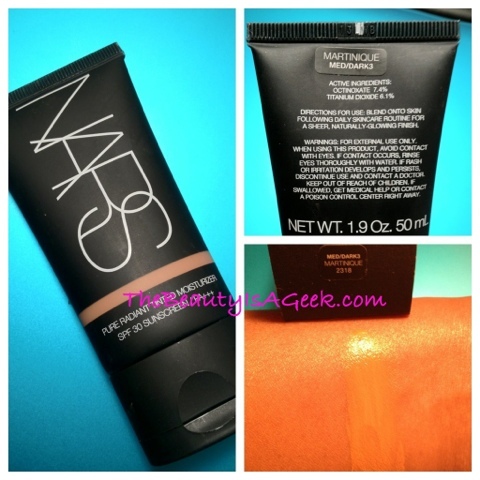 NARS Pure Radiant Tinted Moisturizer is now available at NARSCosmetics.com, Sephora.com and Sephora stores, and of course at Nordstrom.com and Nordstrom stores.